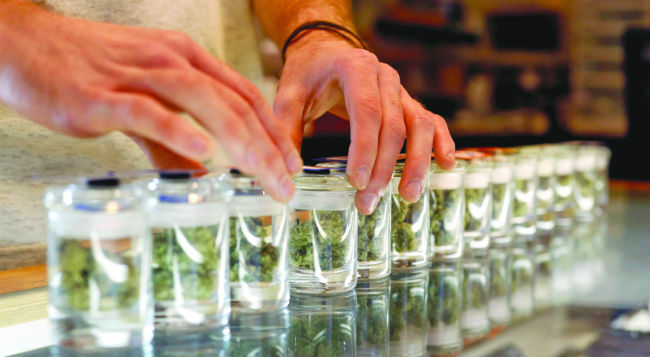 The conundrum that is marijuana continues to challenge employers, as seen recently when a Nova Scotia human rights tribunal ruled an employee’s denial of medical marijuana coverage amounted to discrimination. The decision involved Gordon “Wayne” Skinner, an elevator mechanic employed by ThyssenKrupp Elevator Canada. In 2010, he was involved in an accident at work, leading to physical and mental disabilities in the form of chronic pain and anxiety and depressive disorders. Unable to work, he qualified for permanent impairment and extended earnings replacement benefits. And since various pain medications and anti-depressants proved ineffective, he began using medical marijuana using the appropriate prescription and licence. Initially, the marijuana was covered by his employer’s vehicle insurer but after a couple of years, Skinner had reached the maximum limit of $25,000. So, in May 2014, he asked the board of trustees of the Canadian Elevator Welfare Trust Fund — who are responsible for management of the Canadian Elevator Industry Welfare Trust Plan, which provides health and related benefits — for coverage. But the trustees denied Skinner’s request — three times — because medical marijuana has not been approved by Health Canada under the Food and Drugs Act, so it does not have a drug identification number (DIN), and Skinner’s injuries were the result of a compensable workplace accident, so it said any medical expenses should be covered by the provincial medicare plan. So, in October 2014, Skinner filed a formal complaint with the Nova Scotia Human Rights Commission alleging discrimination in the provision of services on account of physical and mental disability. And, ultimately, the board agreed. For one, the plan stated prescription drug benefits were those “obtained only by prescription” (such as medical marijuana), and it did not expressly limit coverage to drugs possessing a DIN or limit the definition of “drug” to only Health Canada-approved drugs. The trustees also claimed Skinner’s request was not covered because he had not established the marijuana was medically necessary. But the plan did not define “medically necessary” and since the marijuana was prescribed for pain management, “it seems there is a prima facie support for its medical necessity, owing to the fact that conventional prescription pain management drugs are normally eligible for coverage,” said Perryman. The Welfare Plan also granted the trustees broad authority to construe and alter the plan as needed, which could be a case-by-case change or a permanent change, he said. However, the human rights board did not have the jurisdiction to decide if the trustees were in compliance with the plan and collective agreement. But it did have jurisdiction to review the trustees’ decision to make a case-by-case decision or modify the plan, said Perryman. In looking at whether the plan’s exclusion of coverage, and the trustees’ refusal to extend coverage, amounted to a violation of the human rights act, the first step was to determine the purpose of the plan, and the second step was to compare the benefits allocated to employees for the same purpose, said Perryman. The legal purpose of the plan was to provide benefits to beneficiaries, in a way that was efficient, economical and sustainable. But the trustees failed to establish that coverage would result in undue hardship. “There was no evidence presented to suggest that premiums would have to be increased or that the financial viability of the plan would be threatened,” he said. The concept of “medical necessity” also has relevance to the human rights analysis, he said, finding medical marijuana was medically necessary for Skinner, citing medical experts and linkages between the usage and improved functionality, while the under-management of his chronic pain had a severely negative impact on him and his family. And while the trustees claimed Skinner was not treated any differently than any other beneficiary, the plan’s exclusion of medical marijuana had the substantive effect of treating the employee differently. The test for discrimination requires a complainant’s disability be a factor in, or connected to, a policy or decision, said Perryman. The decision does not mean all private or public employee benefits plans are required to cover medical marijuana or any other drug, said Perryman. “Not all distinctions will be discriminatory. The foregoing analysis was dependent on the circumstances of this case,” he said. While Perryman looked at other issues, his purpose was to look at this particular complaint, this particular plan and this particular human rights act — not take a global view, said Kimberly Franklin, senior legal counsel at the Nova Scotia Human Rights Commission in Halifax. Down the road, other tribunals or hearing situations are going to have to look at the basic facts specific to each case, such as the basic disability presented, the person’s needs and the plan involved, she said. The takeaway from this decision is employers or benefit plan administrators have to look at each case on a case-by-case basis, said Courtney Barbour, a lawyer at Barteaux Durnford in Halifax. The trustees failed to establish there was a non-discriminatory justification for their decision to deny coverage, she said. When somebody seeks accommodation, employers and plan administrators have to consider their duty is to accommodate and whatever decision they make isn’t going to be discriminatory, said Barbour. It’s typical in many benefit plans to see caps on coverage, or to only pay for the generic drug instead of the brand name drug, “but they do have the discretion to hear if an employee comes on a case-by-case basis seeking coverage for something that’s not explicitly covered in the plan,” she said. Generally, plan sponsors have not been overrun with requests for coverage when it comes to medical marijuana. But if someone does come forward, employers have been relying on exclusions or limitations around the DIN, said Karen Millard, a senior consultant at Willis Towers Watson in Toronto. That being said, plan sponsors have expressed concern about what should happen if a plan member is in dire circumstances, requesting coverage, she said. And one of the big impacts of the Nova Scotia case is to show there can be times where a plan sponsor should consider the situation on a case-by-case basis. Going forward, it’s about looking at what the prior authorization process should look like around medical marijuana, and in what circumstances it should be covered, said Millard. While the Canadian Life and Health Insurance Association does not comment on individual cases, it is generally up to the employer to decide if it wants to cover medical marijuana under its group benefit plan, said Wendy Hope, vice-president of external relations at the association. “Medical marijuana is not typically covered under group benefit plans for a number of reasons, including that it is not yet approved by Health Canada for safety, efficacy and quality (no drug identifier number has been issued for medical marijuana generally),” she said, adding medical marijuana can already be reimbursed through a health-care spending account.